Rimmel have come out with a new release in their ever extending nail polish collection, this time in the name of sweetie crush. Sweetie crush is a textured nail polish and compares it's self as sparkling sugar in nail polish form and I couldn't agree more. The finish is a little in comparison to Barry M' textured nail effect with the slight feel of grit to your nails, the difference being, these come with plenty of pretty sparkle thanks to the sparkling sugar effect, finish. Available in just five shades, each one being perfect for Spring. There's Sherberts Sweetheart (yellow), Candyfloss Cutie (a warm toned pink), Fizzy Applelicious (turquoise greeny/blue), Violet Swizzle (light purple) and Blueberry Whizz (blue). All retailing at £3.99 each. Shade - Candyfloss Cutie. Two coats. Sorry for the state of my nails at the moment - they are so short. I just love the sparkly finish and the fact they dry harder then a normal polish, I can see them staying put on the nail for a lot longer then your typical polish. Don't get me started on the bottle, I loving the candy shop look and the names to match, it's almost like a carnival fair feel going on. 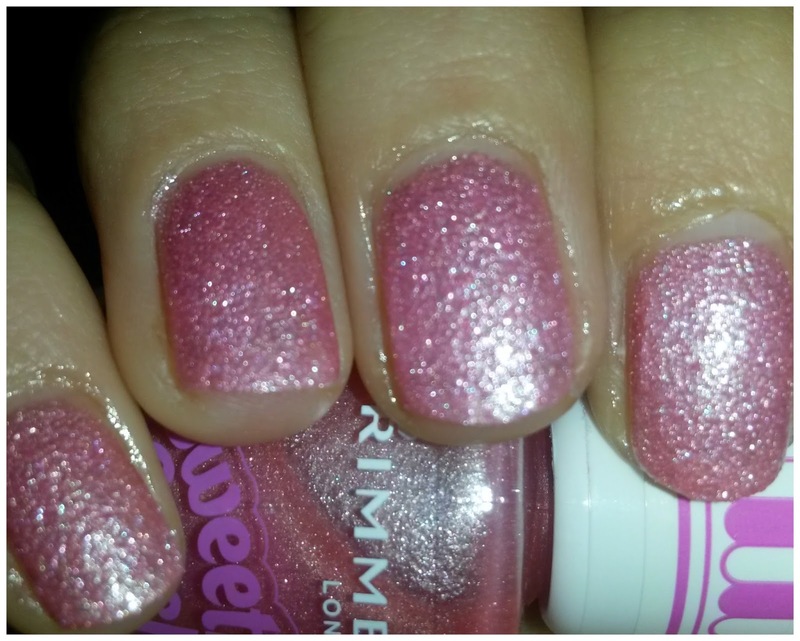 Definitely going to pick up Sherberts Sweetheart, it's such a pretty colour. Rimmel have done it again, I'm impressed. Ahhh I love this!!! It's been a while since I've bought a nail polish but I will definitely be picking some of these up, especially this shade. It looks so pretty and girly!